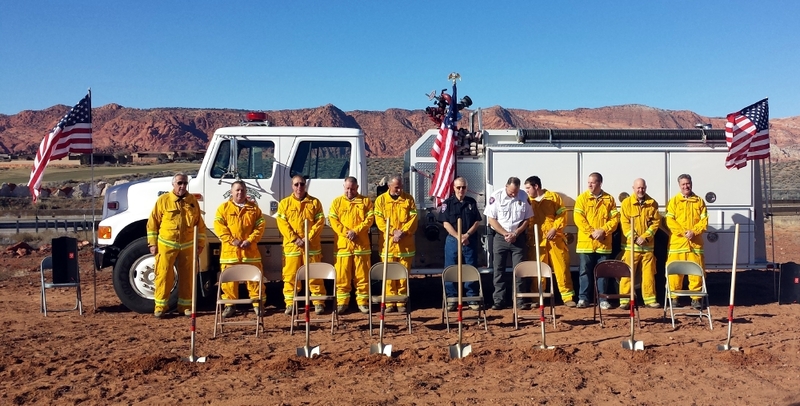 WINCHESTER HILLS – A proud community gathered on Saturday for the groundbreaking of the Winchester Hills Fire Department’s new station. The ceremony started at 11 a.m. with about 65 residents in attendance. Those who were instrumental in bringing the project to fruition each delivered a brief address, followed by the fire crew striking shovels into the ground. The department is currently using a portion of the Winchester Hills Water Company’s building as a station. Located just off state Route-18 at 5297 North Winchester Hills Drive, the new facility will be a 6,300-square foot upgrade that is expected to greatly improve response time. The total cost of the station is approximately $610,000, and the project is being funded mainly by the Southwestern Special Service District with a loan from the State of Utah’s Community Impact Board. Construction is expected to finish by Aug. 30. The all-volunteer department consists of 12 firefighters led by Chief Don Christensen. With three engines equipped to combat structural and wildland fires, they serve approximately 500 residences and businesses covering 50 square miles in Winchester Hills and nearby areas. Operations are funded through a portion of the property taxes in Winchester Hills and Diamond Valley collected by the Southwestern SSD. The department was established over 25 years ago with primitive equipment and scant support. Until 1998, firefighters were alerted to emergencies by an air raid siren atop the station, rather than dispatched. To learn more, call 435-619-3406 or visit the Winchester Hills community website.